We've collected together five unusual Christmas designs, from a rock-shaped mince pie to a collection of bouncing baubles and downloadable wrapping paper. So far this year we've already written about a flat-pack furniture-style chocolate tree, a collection of festive stamps created by Studio Tord Boontje and interior designer Paola Navone's chocolate calendar ice-cream cake for Häagen-Dazs. We've sifted through our submissions box to select five more Christmas design projects, including alternative decorations and an unconventional Christmas tree. London designer Sebastian Bergne has found a new use for children's rubber bouncing balls, turning them into festive decorations. 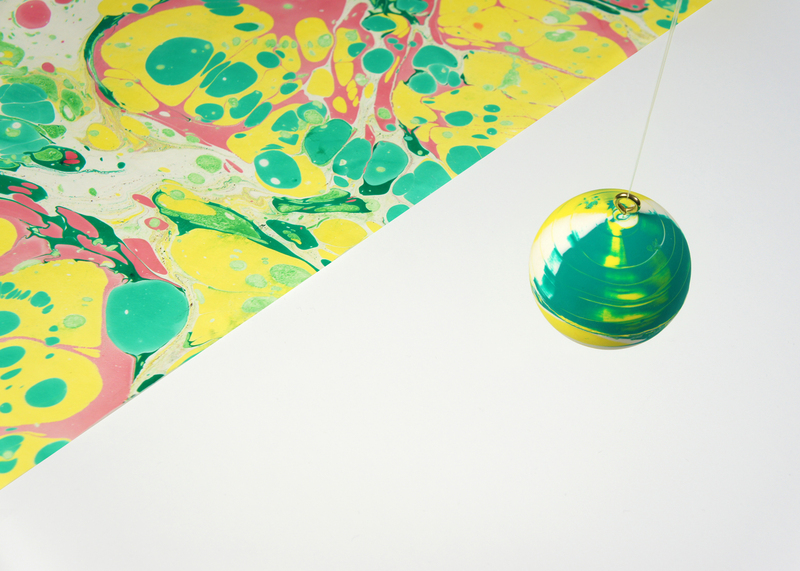 The baubles are available in marbled or solid colours, and hang on minimal brass circles set into the top of each ball. London design firm Studio Ilse, which this year launched its "deliberately low key" collection for Ikea, has created a set of downloadable sheets of wrapping paper. Available in five different colour combinations, each design features a pattern of flying angels that appear to have been painted in blurry watercolours. Pastry chef Regis Cursan, from London restaurant Nobu, has designed a "dark" mince pie, with a craggy base made from black coconut ashes and sesame paste. The pie is stuffed with apricots, apples and nuts, and features a pair of meringue pebbles balanced on top. Slovenian designer Klemen Smrtnik of Desnahemisfera created a tongue-in-cheek alternative to traditional baubles, with a kit that helps users create their own "origami" versions. Each pack comes in a candy-striped paper tube, and contains all the materials needed, including sheets of paper and ribbon loops, to create a scrunchy bauble. Hungarian architecture studio Hello Wood has used 365 sleighs to construct an illuminated 11-metre-tall tree for London's Granary Square, at King's Cross. The Let It Snow tree – named for a time when snow was a regular Christmas occurrence – will be dismantled after the festive season, with 100 sleds donated to London schools. Last year the studio used sawn logs to create a conical Christmas tree, which was installed in Budapest and distributed as firewood after the holiday was over.